Fort Montgomery, NY: The First "Gasm"
A few years ago, members of the Loyal American Regiment attempted their first "Rev. War-gasm." This comically vulgar term was inspired by the "Civil War-gasm" made famous in the best selling book Confederates in the Attic. Some of us liked the concept and have hijacked it, adapting it to our preferred time period. For us, a Rev. War-gasm is a "period rush" created by carefully studying the actual history through primary sources, putting on our 18th century Loyal American Regiment clothing, walking on the very ground where our regiment fought and letting our imaginations run wild. With any luck, the Revolutionary War becomes much more than accounts in books. Our first stop was along the Hudson River at Fort Montgomery, NY. 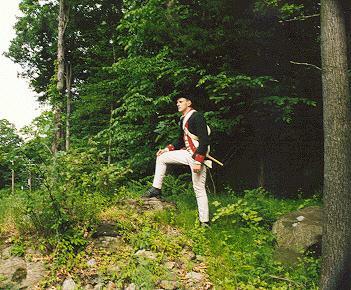 Here, the Loyal American Regiment (and more specifically Captain Joshua Barnes' Company -- the company we portray) took part in a successful assault on the rebel fortress in the late afternoon of October 6, 1777. 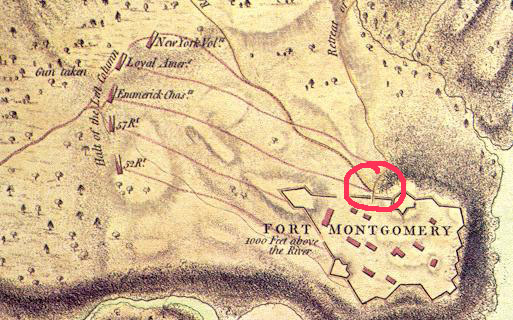 Using a period map, we searched the few remaining stones which mark the foundations and discovered the location where Captain Joshua Barnes' Company entered the fort. As we stood upon the stones with our muskets in our hands, it was remarkable to reflect upon the fact that we were standing where they stood. We imagined the noise, the smoke, the chaos of the battle. For anyone else passing this spot, it is an unexceptional patch of woods beside a road. To us, it is something different. The earth called out to us and we listened. Yes, it was a "period rush." 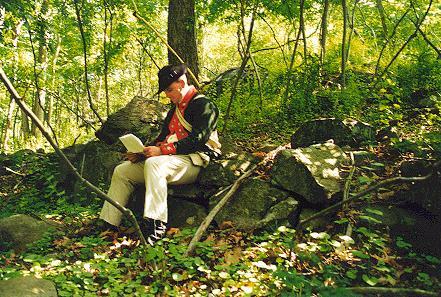 Mr. Briggs reads the actual court martial of Captain Barnes (for his actions at Ft. Montgomery) while sitting upon the remains of Ft. Montgomery, just yards from where Barnes and his men stormed the wall in 1777. LAR soldier stands upon the ruins looking outward -- near the spot where our company entered the fort. It was a brutal assault from all accounts. Read our regimental history for more details. Then, we were off. 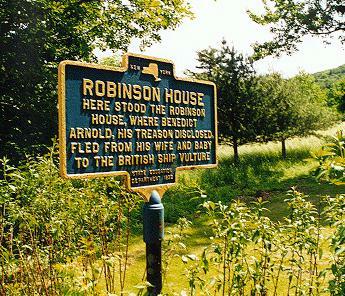 First, we did a quick "drive-by" of Bloody Lake and Ft. Clinton, then over to the other side of the Hudson River to locate the summer house of Colonel Beverley Robinson, our commander. The house burned down in 1892 but we stepped upon the ground where it once stood. Most who know of the Robinson House only know it as the house that Benedict Arnold fled from when he realized he had been discovered as a traitor to the American cause. To us, it was something more. Here lived Bev. Robinson, one of the wealthiest and most influential loyalists in all the colonies. The sign talks about the infamous Arnold -- not a mention of the fact that Beverley Robinson was the colonel of a loyalist regiment. The view of nearby Sugar Loaf Mountain was extraordinary. It was amazing to think that we were seeing the exact same view that Beverley Robinson had when he stood in front of his house. Even the famous Joseph Plumb Martin ("Private Yankee Doodle") had this view when his regiment camped upon Robinson's property after the storming of Stony Point in 1779. 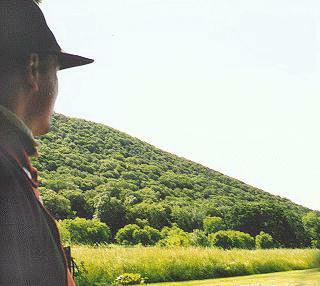 Mr. Briggs looks up at Sugar Loaf mountain. In addition to Bev. Robinson, George Washington and Benedict Arnold saw this same view when they stepped from the house. 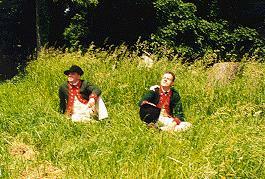 LAR soldiers relax on the ground beside the house of our commander, Colonel Beverley Robinson. We're sitting just outside what would have been the east side of the house. Lossing's 1840's drawing of the room in Robinson's house where Arnold was at breakfast when he learned he had been exposed. The door to the right led to a room Arnold used as an office. The windows on the left face the south where Lossing sketched the exterior of the house. Before leaving, we couldn't resist the urge to retrace Benedict Arnold's steps. Taking a short walk up the road, we came to the path Arnold used to flee to the Hudson River. Mr. Briggs puts himself in the shoes of Benedict Arnold as he flees down the same path Arnold used when he realized the jig was up. This ended our first Rev. War-gasm. 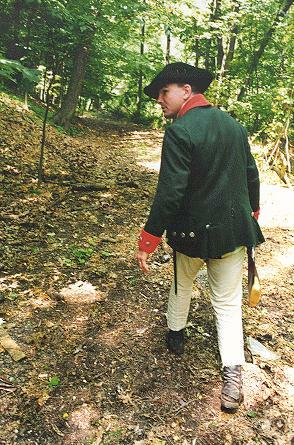 It was a very good lesson that reenacting can be much more than blowing off blackpowder. We can also be custodians of history, as corny as that may sound. We definitely hope to do more of these "Gasms." It's not to everyone's taste (and not normal, according to some) but for a few LAR members, it's an interesting addition to what we do.